In this example we'll make an apple pie with both a top and bottom crust. If you only need a single crust, ignore steps 11-13 that deal with the upper crust. Need a pie idea? Try my Pie recipe page. Need the recipe for the dough? 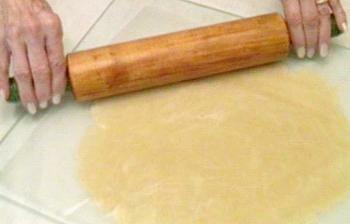 Check out my recipe for an 8-inch pie crust. 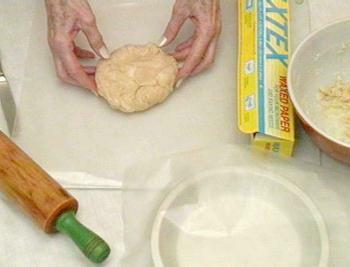 Roll dough into a ball and flatten slightly. Place on waxed paper. 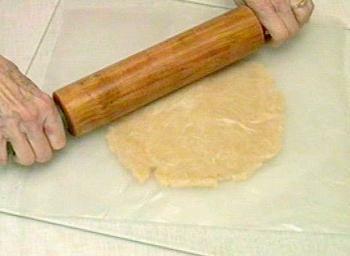 Place second piece of waxed paper on top of dough and begin rolling dough out evenly (in a circle). This shot shows the dough rolled out to about 10 inches. This size will allow the dough to fit the inside curves of an 8 inch pie pan.